Jan Karol Chodkiewicz was a military commander of the Polish–Lithuanian Commonwealth army who was from 1601 Field Hetman of Lithuania, and from 1605 Grand Hetman of Lithuania, and was one of the most prominent noblemen and military commanders of the Polish–Lithuanian Commonwealth of his era. 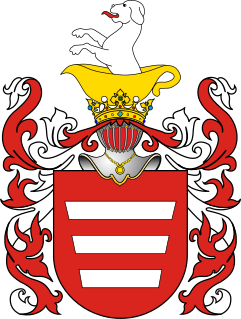 His coat of arms was Chodkiewicz, as was his family name. Stanisław Żółkiewski was a Polish nobleman of the Lubicz coat of arms, magnate and military commander of the Polish–Lithuanian Commonwealth, who took part in many campaigns of the Commonwealth and on its southern and eastern borders. He occupied a number of high-ranking posts in the administration of the Commonwealth, including castellan of Lwów, voivod of the Kiev Voivodeship and Great Chancellor of the Crown. From 1588 he was also a Field Crown Hetman, and in 1613 was promoted to Grand Hetman of the Crown. During his military career he won major battles against Sweden, Muscovy, the Ottoman Empire and the Tatars. The Battle of Cecora was a battle between the Polish-Lithuanian Commonwealth and Ottoman forces, fought from 17 September to 7 October 1620 in Moldavia, near the Prut River. The Battle of Byczyna or Battle of Pitschen was the deciding battle of the 1587–1588 War of the Polish Succession, which erupted after two rival candidates were elected to the Polish throne. Both sides had rough parity in forces, with armies about 6,000 strong, divided roughly into half infantry and half cavalry. The battle was an overwhelming victory of the Polish-Swedish faction, led by the Swedish-born king-elect Sigismund III Vasa, over the army of his rival to the throne, Maximilian III, Archduke of Austria. Taking place near the Silesian town of Pitschen, then just a few kilometres outside the territory of Poland-Lithuania, on 24 January 1588, Sigismund's supporters were commanded by Chancellor and Great Crown Hetman Jan Zamoyski. Besides the commanders, notable participants included Stanisław Stadnicki on Maximilian's side, and Stanisław Żółkiewski on Sigismund's. The army of the Polish-Austrian faction was largely annihilated, the Archduke was captured and his cause came to an abrupt end. He subsequently renounced his claim to the Polish throne. The Battle of Khotyn or Battle of Chocim or Hotin War was a combined siege and series of battles which took place between 2 September and 9 October 1621 between a Polish-Lithuanian Commonwealth army and an invading Ottoman Imperial army. The Commonwealth commanding officer, Grand Hetman of Lithuania Jan Karol Chodkiewicz, held the forces of Sultan Osman II at bay until the first autumn snows, and in the end died during the battle. On 9 October, due to the lateness of the season and having sustained heavy losses in several assaults on fortified Commonwealth lines, the Ottomans abandoned their siege and the battle ended in stalemate, reflected in a treaty that in some sections favoured the Ottomans and in others favoured the Commonwealth. The Siege of Smolensk lasted almost a year between 1632 and 1633, when the Muscovite army besieged the Polish–Lithuanian city of Smolensk during the war named after that siege. Muscovite forces of over 25,000 under Mikhail Borisovich Shein begun the siege of Smolensk on 28 October. Polish garrison under Samuel Drucki-Sokoliński numbered about 3,000. The fortress held out for nearly a year, and in 1633 the newly elected Polish king Władysław IV organised a relief force. In a series of fierce engagements, Commonwealth forces gradually overran the Russian field fortifications, and by 4 October the siege had broken. Shein had become besieged in his camp, and began surrender negotiations in January 1634, capitulating around 1 of March. The Polish Thermopylae is a name used to refer to several battles in Polish history. The Polish Thermopylae is a reference to the Battle of Thermopylae, where a Spartan force chose to fight to the death while vastly outnumbered. 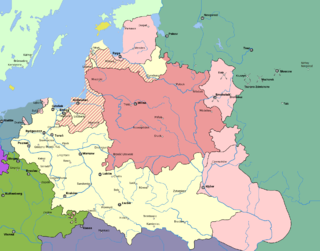 The military of the Polish–Lithuanian Commonwealth evolved from the merger of the armies of the Kingdom of Poland and the Grand Duchy of Lithuania following the 1569 Union of Lublin, which formed the Polish–Lithuanian Commonwealth. 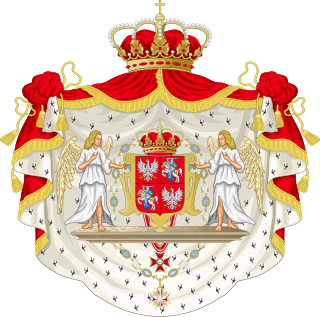 The army was commanded by the Hetmans of the Polish–Lithuanian Commonwealth. The most unique formation of the army was the heavy cavalry in the form of the Polish winged hussars. The Polish–Lithuanian Commonwealth Navy never played a major role in the military structure, and ceased to exist in the mid-17th century. Mikołaj Struś (1577–1627) was a Colonel of the Polish Army, a starosta and commandant of the Polish-Lithuanian garrison in the occupied Moscow Kremlin. He was the last known member of the Strus family of Komarow-Osada. His father was Jakub Strus, and mother was Barbara Potocka.